This is the third post in a trilogy reflecting recent activities. This one really makes me pinch myself to realise just two-and-a-bit years ago I was stepping away from a career as a senior manager at Cisco Systems leaping through the fiery hoops that were business process improvement, sales operations and customer services—across 83 countries, 23 time zones and operationally accountable for over $800M of annual bookings (gulp). Now look at the state of me?! 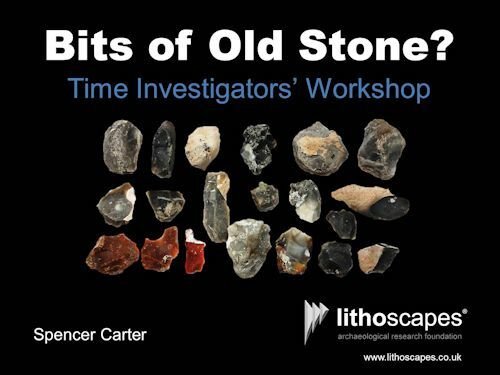 I was thrilled, back in February, to be invited by Kevin Cale to deliver a prehistoric lithics workshop for an after-school kids group and then for a local community group about to engage with fieldwork to gain a deeper understanding of their area. Kevin is a well-known Community Archaeologist supporting diverse projects across North Yorkshire. I’ve always loved imparting knowledge with enthusiasm, but these would be my first such sessions (probably since university in the late 80s) to an audience. That said, I did give a short presentation to the Teesside Archaeological Society about my Mesolithic research and excavations last year. However, teaching about stone tools—flint, chert and the like—is quite a different knapping event—without knapping on health & safety grounds. Indeed, the remit was less related to the rendition of flint tools, at which I am a keen amateur, than explaining how lithic technology can tell us about our past communities, their lifestyles and environments, within dynamic landscapes, over millennia and—more to the point—as a prelude to archaeological fieldwork. I’m also very grateful to Clive Waddington (Archaeological Research Services Ltd.) for allowing me to use, adapt and distribute as a handout, an excellent diagram from his book (see Recommended Reading, at the end of this post). Proceeds from the sale of this book go towards maintaining a public trail in the Millfield area of Northumberland. “Understand your audience” is always the mantra. In this case, the first session was with a group of seven-to-eleven year olds in an after-school session known as the HOP Club—Hand on the Past—a fantastic Heritage Lottery-funded project run by Kevin. The second session was for the Boroughbridge & District Historical Society whose community venture, the Dog Kennel Lane Project, is coming together. The first episode of fieldwalking kicked off the weekend after the lithics workshop and flints were recovered. At the end of the day the two sessions were not that different and the same materials (and principles) worked for each. Each session lasted about two hours. Being a native of North Yorkshire, despite subsisting for two decades in central London, I was already aware of the very special landscape these two groups are located within. The Vale of Mowbray (and Vale of York) is a vast flat plain between the east-facing Pennines and the south-westerly flanks of the North York Moors and Howardian Hills. Boroughbridge sits close the confluence of two major Pennine river drainages—the Swale and the Ure (Wensleydale) that join the Nidd to become the River Ouse which then flows through (sometimes over) York towards the mighty Humber estuary. These rivers were major transit corridors throughout prehistory. 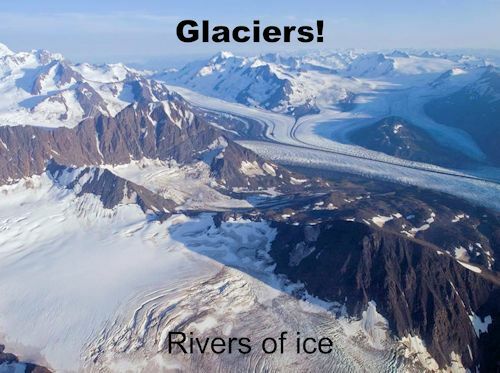 The vale was entirely glaciated in the Late Devensian with ice flows from the north, the Pennines (limestone-based cherts), Lake District (igneous rocks) and Scotland—it would not have looked dissimilar to the illustration here. Moraines and related glacial features persist, barely masked, in today’s landscape. In the early post-glacial and into the Mesolithic, with a climatic optimum around 5000 BC (and almost impenetrable deciduous forests), this area would have been a resource-rich “wetland” (or “washlands”) with kettle-hole lakes and rivers. Glacial tills, boulder clay and riverine gravels are especially important in understanding the raw material available to the prehistoric inhabitants of the area, more so when it is found “out of context”. To the east, glaciers dragged flint (and more) from Scandinavia and the bed of the North Sea and trapped huge lakes in the Vale of Pickering and Teesmouth. We find all of this in the archaeological record. Into the Neolithic and Bronze Ages this was a very special place indeed. Only a few kilometres away is the immense ritual landscape comprising the Thornborough henges, cursus, pit alignments, stone alignments (the Devil’s arrows) and burial mounds. Jan Harding’s new book Cult, Religion, and Pilgrimage Archaeological Investigations at the Neolithic and Bronze Age Monument Complex of Thornborough, North Yorkshire (CBA Research Report 174) places recent investigations into a regional context. With local evidence for human activity from at least the Early Mesolithic (there are cheeky hints of possible epi-Palaeolithic late glacial meanderings) up and around the river valleys and kettle holes, the scope for what the community might recover in their systematic fieldwork, where every find is GPS recorded, is tremendously exciting. But how does one know what to look for, whether it is natural, what it is, how it got there, what it was for and how old it is? 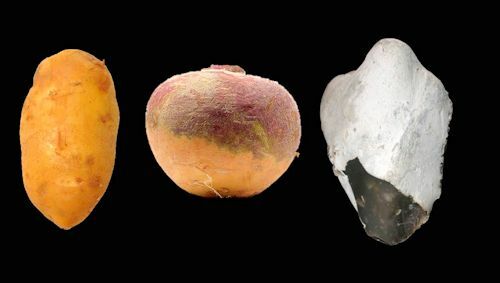 The Turnip and Potato Game | Reversed Technological evolution? Engaging the kids, who already had a grounding in the “Three Age System”, was not as difficult as I envisaged. However, Kevin and I were determined to knock a couple of misconceptions on the head (not literally): that prehistory = cavemen/women and that stone tools are inferior. Preparation for the latter involved a lovely half hour of flint knapping in my back garden at home using huge nodules collected on a beach near Hartlepool in January. A 5kg nodule produced an equally impressive giant core after flake and blade (and finger) removal. Spalls flew in my face like shrapnel and ricocheted over a vast area! I only lost one finger, since darned back on. Metal is better than flint? We kicked off with a game. Whilst a volunteer butler laid out my picnic dinner service, the kids were each given a potato or turnip, plastic knife and paper plate. Napkins were available but seemed incongruous. Each then had to try cut the end off one of the vegetables. It took an age for the first prize to be awarded. 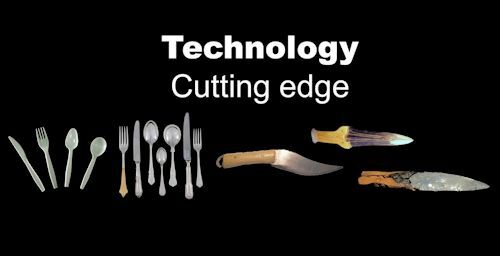 Technological ‘advancement’ has yielded plastic cutlery. What would be better? A metal knife? I demonstrated: it was faster but still a slow sawing process. And then, behold the flint flake. My potato end parted company with its body in only two sweeps of the gleaming infinitely-sharp edge. It was like Zorro on steroids. Point proven (limbs retained, no first aid needed)! 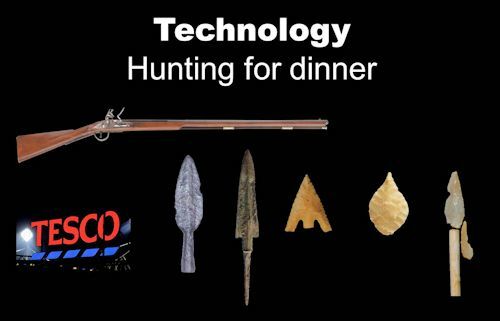 We then looked at other technology for which stone tools are either comparable in success—or even better than—their metal counterparts. Bronze, for example, easily blunts and one has to wait a few thousand years for the advent of iron, longer still for steel. The HOPs Club kids were asked to bring along a photograph of at least three generations of their family, preferably four if a great grand parent was around. The concept of time depth and chronology is a very difficult one to deal with, especially when we’re travelling around 12,000 years to the last glaciers. Then, on a 6m role of wrapping paper unrolled over four tables, we drew out a timeline from the photographs back to 12,000 BP (50cm per 1k years). The kids added both “BC” points and “BP” (even though that’s AD 1950 in radiocarbon terms—a minor detail) so we could relate the two. We then assumed that about four generations represent a century and, with wizard maths skills, added how many generations each 1k years represented—that’s about 480 back to the Early Mesolithic post-glacial. While big numbers, I do think this personalises time and, it certainly showed across the tables, the vast tract that is the Mesolithic hunter-gatherer-fisher period. We then laid out real artefacts and replicas—a real hands-on exercise—from an 18th-century gunflint right back to Early Mesolithic microliths and and a tranchet axe. The same wrapping paper was used for the adult session later that evening—very successfully. It was rather gratifying to pass over the entire Medieval, Early Medieval and Roman periods with a certain contempt for their short duration. In the end we didn’t get time to play the Hertzian Waves game, despite careful choreographic planning. This game was supposed to demonstrate how Hertzian forces work on a dense siliceous material like flint when one hits it. The game was to be an around-the-room chain of children, a front kid gently bashed with an antler, a linked-hand Mexican wave motion flowing around (a bit like shaking a hosepipe) and a giant-sized blade made from foam-board springing of the side. In the end the foam-board blade worked in both sessions to show the morphology of a humanly-knapped blade and the nomenclature used by lithicists (distal, proximal, ventral, dorsal, platform, and so on). The kids all had jewellers’ loupe magnifiers too so that they could look for the characteristic signatures of humanly-knapped flint: a platform, bulb of percussion, ripples, dorsal scars, edge retouch, pressure flaking. If there was a finale then it was to show that flint use persisted until very recently. 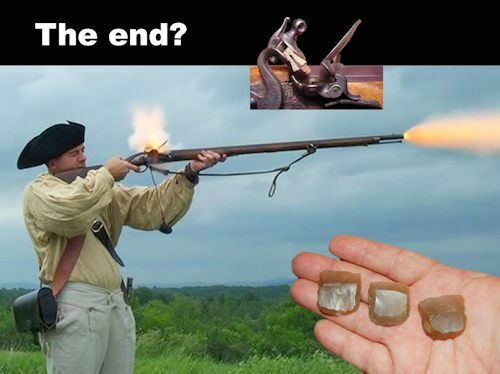 A gun flint and firelighter flint demonstrated that raw materials and technology “do not age” when they are entirely fit for purpose. And obsidian, the sharpest material of all, is sometimes still used for its prowess as a cutting material—even in modern surgery I hear? Image | Upper Palaeolithic flint tools at Crewsell Crags. After both sessions were completed, a quick drive back from Roman Aldborough (ISVRIVM BRIGANTVM) to the hotel (Best Western in Boroughbridge, a fine value-for-money establishment) and before indulging in a round of sandwiches, I sat with a local landowner and businessman to look through his lithics. His fields are very close to the A1(M) and the pit alignments recorded in Jan’s book. There was a resplendent presence of every period from the Late Mesolithic and some whopping pieces that wouldn’t look out of place at Crewsell Crags (I dropped in on the way back) that hint at possible Early Mesolithic (if not earlier) human presence on the side of a palaeochannel visible in aerial photographs. Needless to say that the landowner intends some more fieldwalking and, perhaps, shovel pits (with sieving) under Kevin’s guidance. To see such fascination with local heritage alongside a deep care to record it in the correct way is, most certainly, the greatest reward for any archaeologist and lithicist. All speed to their feet and elbows! 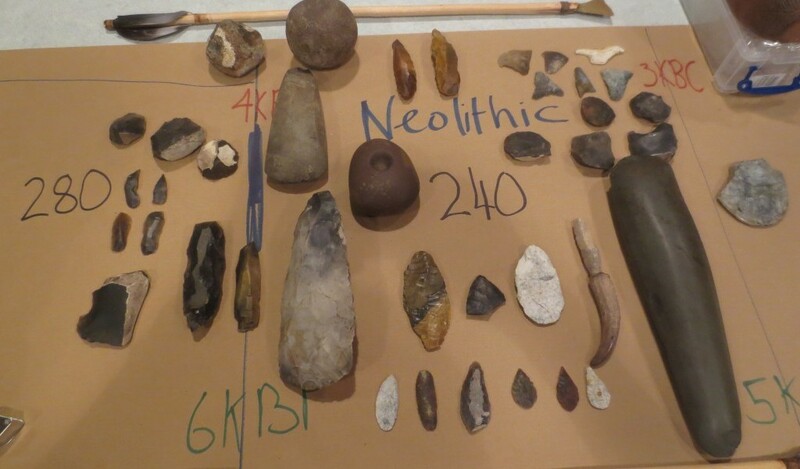 This entry was posted in British archaeology, Education, Events and activities, Lithic analysis, Microburin miscellaneous and tagged Archaeology, Community Projects, Flint, Prehistory, Public Archaeology, Schools, Stone Age by Spencer Carter. Bookmark the permalink.